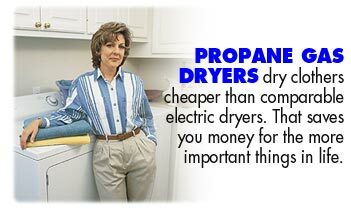 A recent study for the Texas Railroad Commission found that using a propane dryer would save Texas households an average of $40 each year. Propane gas dryers offer all the conveniences and energy-saving options available on other dryers. Pilotless ignition is also standard, eliminating the need for energy-wasting pilot lights.